For the Planetarium at Vitenfabrikken in Sandnes, Norway, SUPERFLEX created Crimetime – a new narrative genre, which has been dubbed "starplay". Crimetimepresents the audience with the dimension of time travel, but rather than the creation of the universe, Crimetime evolves around a local story about Speedway Stig, a member of the notorious West Land Mafia which ravaged the Jæren region on the Norwegian west coast for years. Inspired by Thomas Ergo's documentary book "Kjeltringer" (Nordic Crime Chronicle, 2008),Crimetime tells the actual events (by way of a voice-over) of Speedway Stig’s pilfering around Jæren ten years ago while the stars above the audience shows the exact constellations accompanying the events of Speedway Stig at any given time. 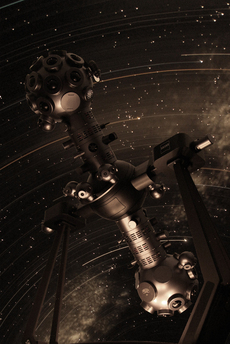 The planetarium is equipped with a Carl Zeiss SKYMASTER ZKP 4 projector – one of the most advanced planetarium projectors for small and medium-sized domes capable of showing the exact position of the stars at any given location and time, 10.000 years back and ahead of our time.